In early October, Ian and I visited Yosemite National Park with his family. While Ian and his family had all visited the park before, it was my first time visiting America’s oldest protected parkland. Here are 8 stops we visited that any first time visitor wouldn’t want to miss! 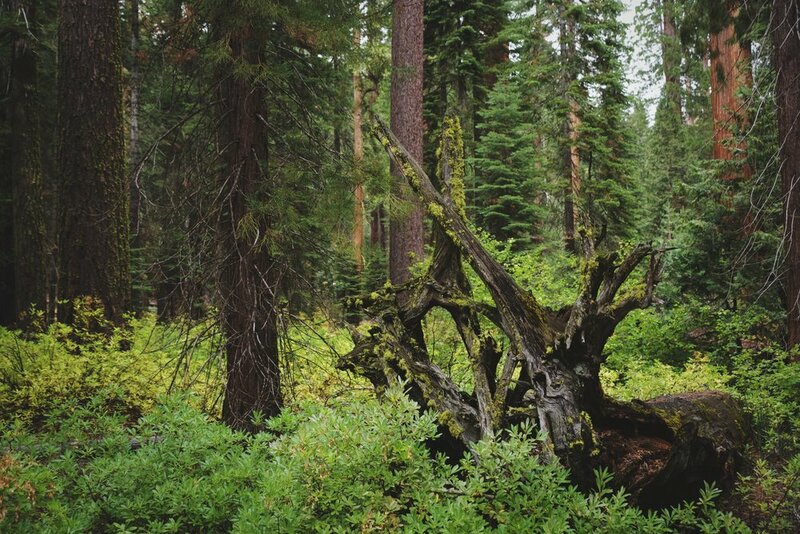 At the end, as with all our blog posts, you’ll find free camping suggestions near Yosemite. 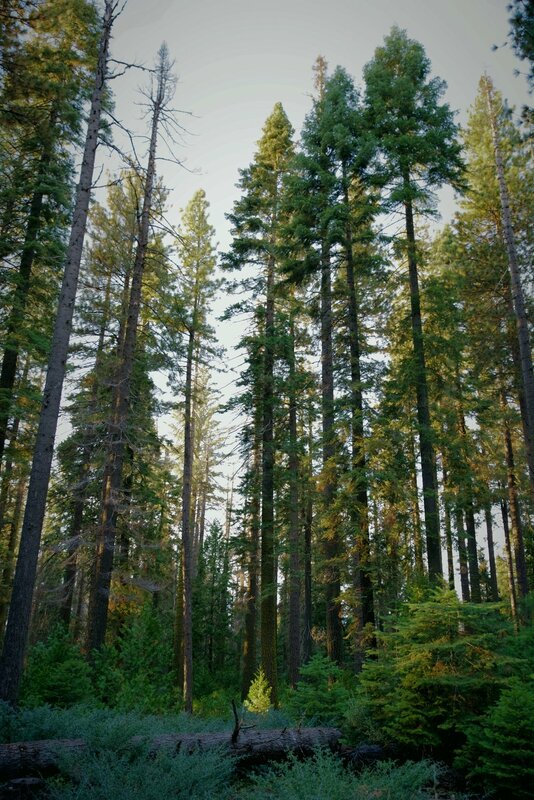 You don’t have to go to the Redwood Forest to experience towering trees. Yosemite’s got it all. Mariposa Grove at the southern end of the park has over 500 mature giant sequoias. A few of the more notable trees are the massive Grizzly Giant, the Bachelor and the Three Graces, the California Tunnel Tree, and the Fallen Monarch. All of which are accessible on an easy two-mile trail. Posing in front of the Fallen Monarch in Mariposa Grove. Ian and his sister posing in front of the same tree when they were kids. In 2015, the grove underwent a massive restoration project that both improved trails and protected the trees from damage that was being caused to their root systems. In order to visit the grove all visitors, except those with disabilities, must now ride the free shuttle, which leaves every ten minutes from the Mariposa Grove Welcome Center. The Grizzly Giant has some branches that are as big as many of the trees surrounding it. Ian, his dad, and his sister inside the California Tunnel Tree in Mariposa Grove. Yosemite was extra green and fresh when we were there because of recent rain. 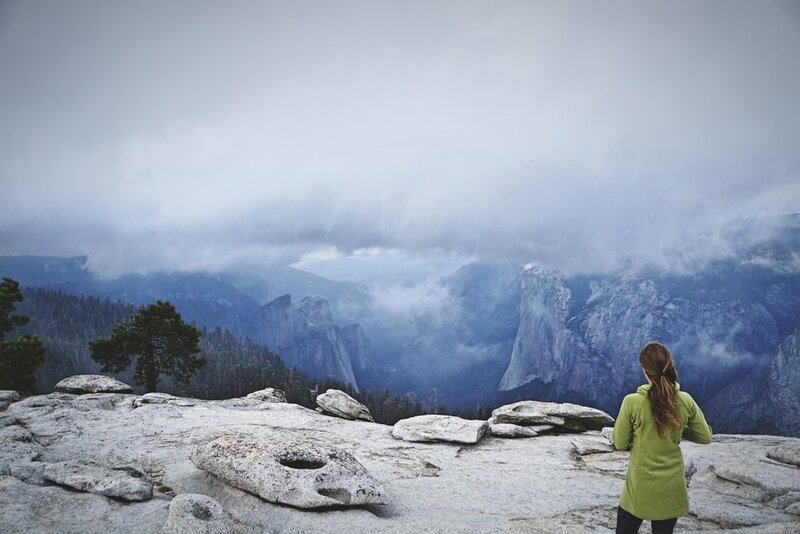 Glacier Point is one of the most popular viewpoints in Yosemite, and for good reason. It offers a fabulous view of not only Half Dome, but also Tenaya and Yosemite Valley’s which surround it; a smaller dome, Liberty Cap; and Vernal and Nevada Falls. Sunset is a great time to visit Glacier Point. When we were visiting the sky changed from moody blue clouds to a bright pink projection on Half Dome. The sky started as this really stormy dramatic view. While we were leaving Glacier Point, we noticed Half Dome turn this rosy pink color. Glacier Point is about a half hour drive from Yosemite Valley, at the end of Glacier Point Road. 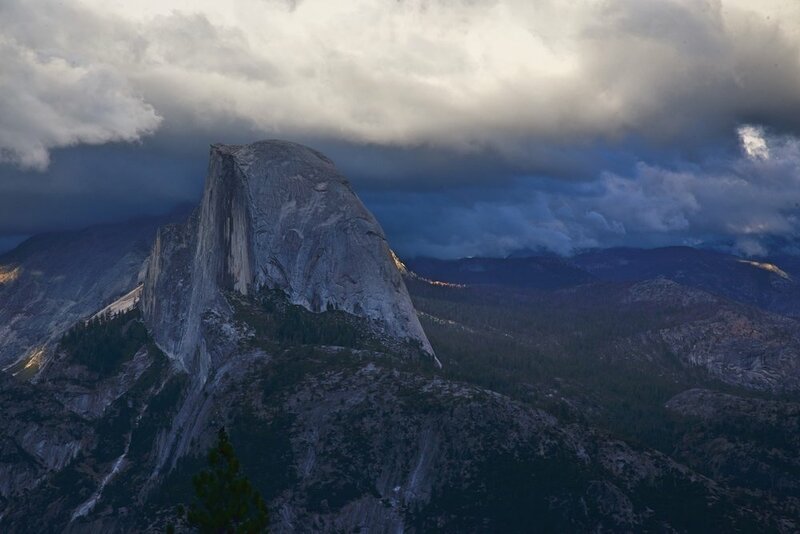 There are a number of hiking trails that start from Glacier Point. 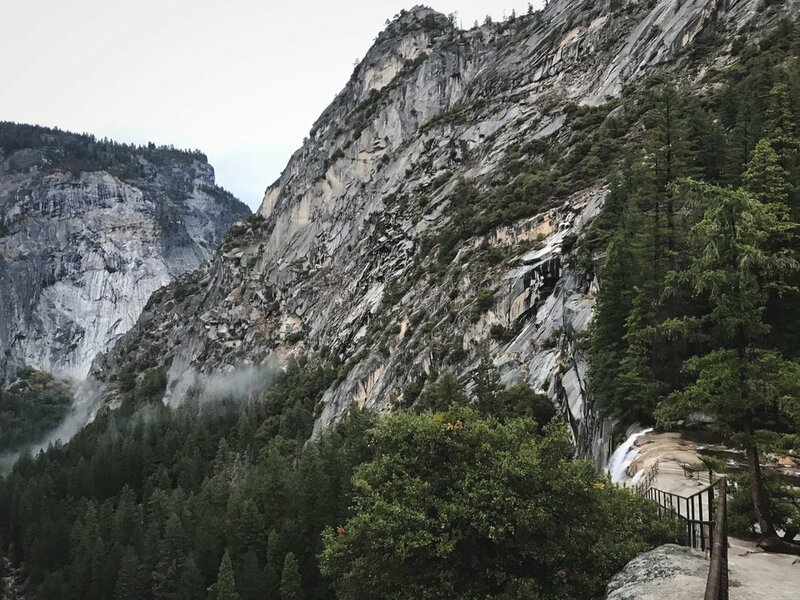 You can even hike from Yomsemite Valley to Glacier Point if you are up for some major elevation gain. The view in the opposite direction of Half Dome is also really beautiful at sunset. 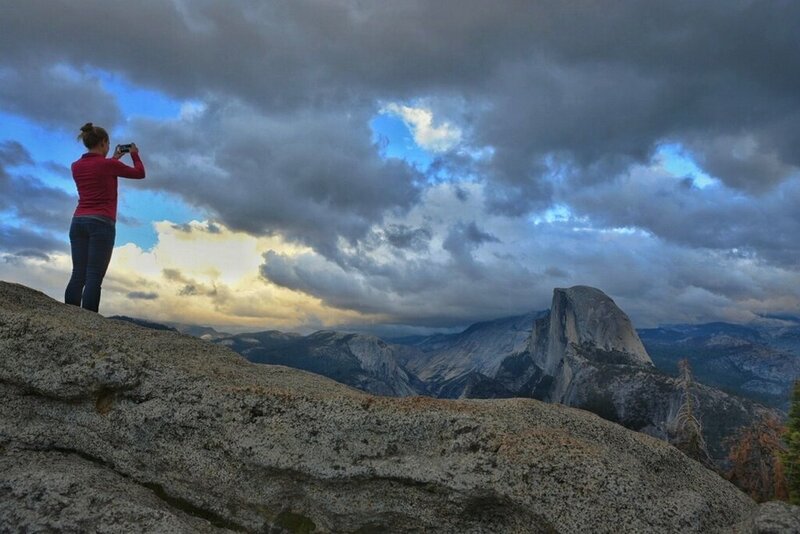 Glacier Point is one of the most popular photo spots in the park. Washburn Point is definitely worth the stop on the way to Glacier Point. Washburn Point shows you less of the North Face of Half Dome and more of the actual dome. Also accessed from Glacier Point Road is Sentinel Dome, although you will have to do a bit of hiking to reach this stop. The fairly easy trail two-mile trail leads you to the base of Sentinel Dome where you climb up the open granite surface to the summit. The views are stunning. To the west, Yosemite Valley and the Merced River stretches into the distance, while to the north Half Dome, Liberty Cap, El Capitan, and Clouds Rest stand guard. Ian standing by the fallen Jeffrey Pine made famous by an Ansel Adams photograph. 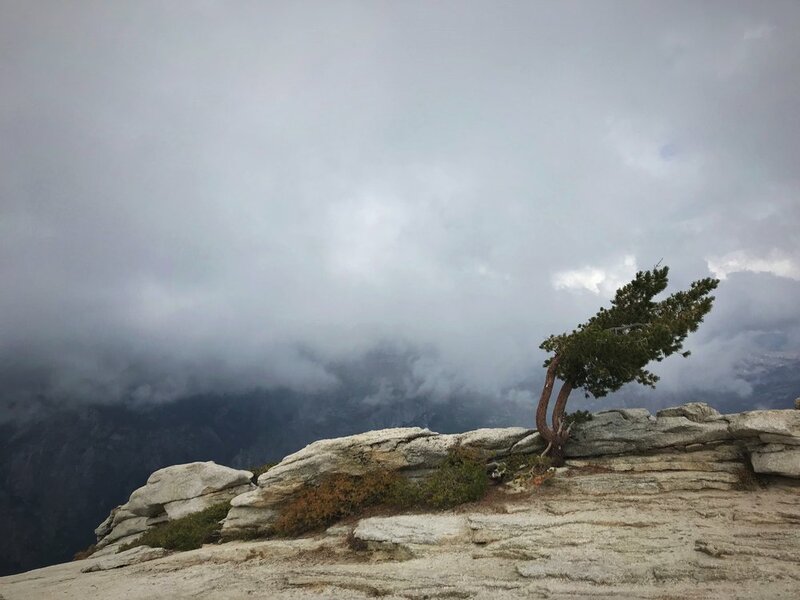 Another windblown pine on top of Sentinel Dome. 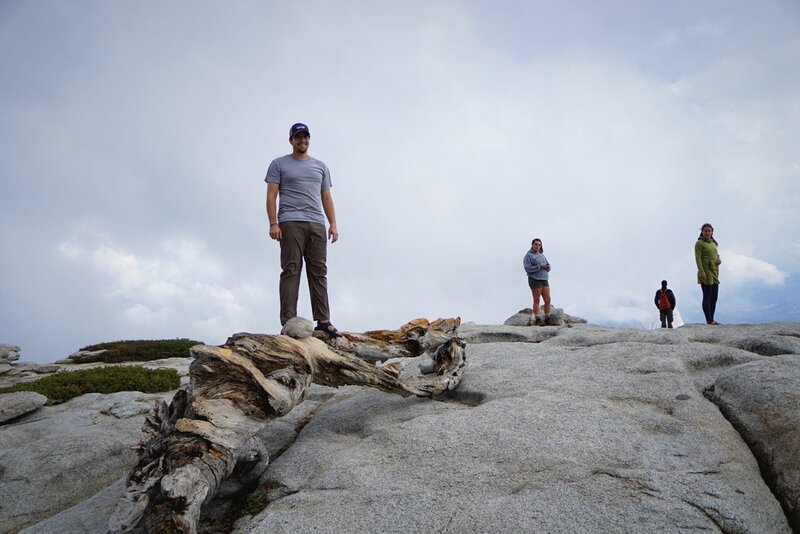 Don’t miss the fallen Jeffrey Pine on the summit. This tree was made famous by an Ansel Adams photograph. It died from drought in the late 70s, even though people carried buckets of water to it. 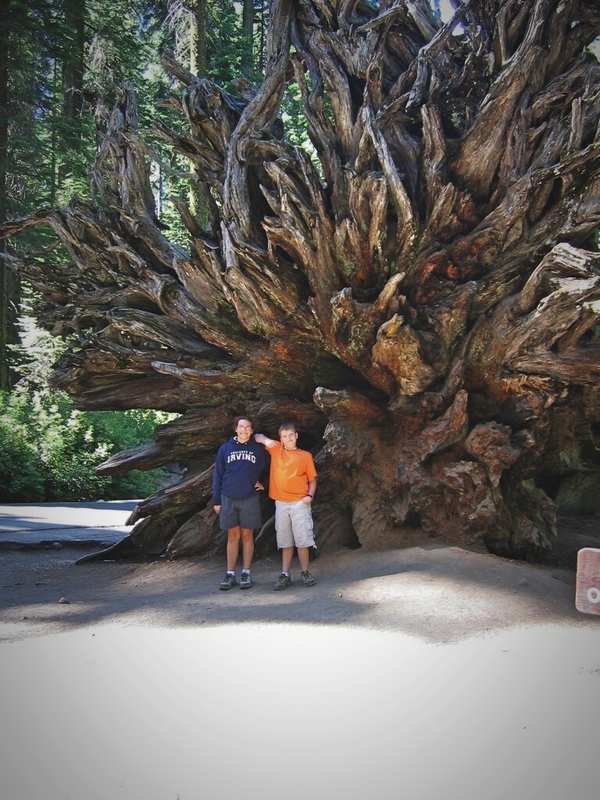 In 2003 the tree finally fell over, but you can still see it’s gnarled trunk on top of Sentinel Dome. The view looking down Yosemite Valley from Sentinel Dome. Located about a few miles up the Mist Trail from Yosemite Valley, we visited Vernal and Nevada Falls on our way to the top of Half Dome (check out our blog post about that adventure here!). The trail is very steep, but it is paved for over a mile and a half all the way to bridge at the bottom of Vernal Falls. From there you climb steep granite stairs that lead to the top of Vernal Falls. In some places, the stairs are built into narrow ledge on the side of a cliff! The narrow stone steps built into the rock wall. Vernal Falls is really beautiful even when the water is low. 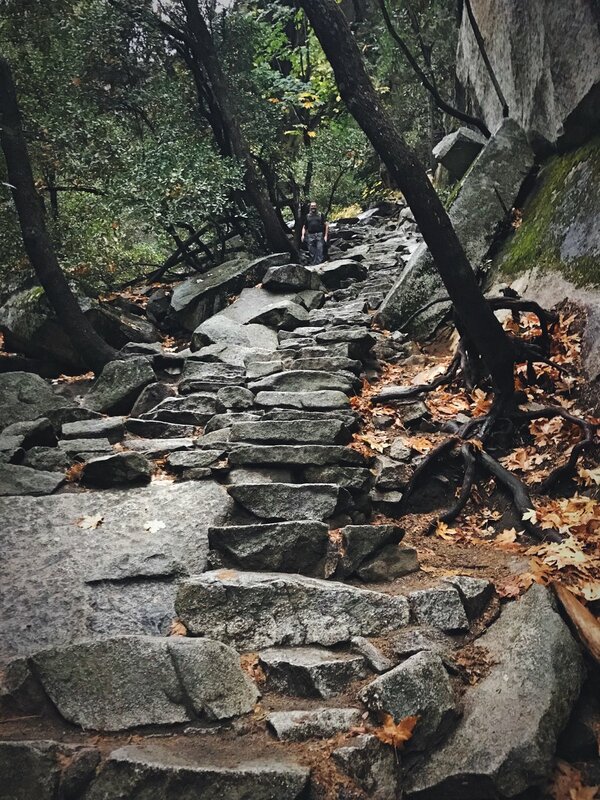 The mist trail has so many of these steep granite steps. The Mist Trail is named that because the waterfalls cause so much mist along the trail, but when we were there in fall, the only mist we experienced was from the sky. Still the waterfalls were very beautiful despite the water running so low. Probably because of the low water, Vernal Falls made a sound we had never before heard from a waterfall—a curious, erratic thwacking noise as it hit the rocks below. At the top of Vernal Falls are the Emerald Pool and the Silver Apron, where the Merced River gracefully slides into a green pool. Although it might seem like a tempting place to take a dip, there are deep currents that have swept even strong swimmers over the edge of the waterfall. In fact more people are killed along the Mist Trail than anywhere else in the park. The view from the top of Vernal Falls and the guardrail leading down to Vernal Falls. 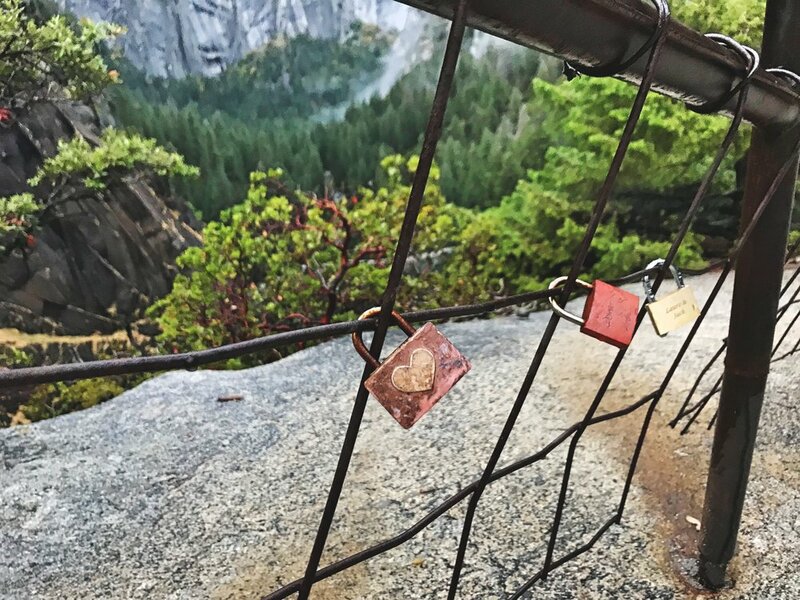 Love locks on the fence at the top of Vernal Falls. Beyond the Emerald Pool, which forms the “step” in the “grand staircase,” you continue to climb until you reach the base of Nevada Falls. 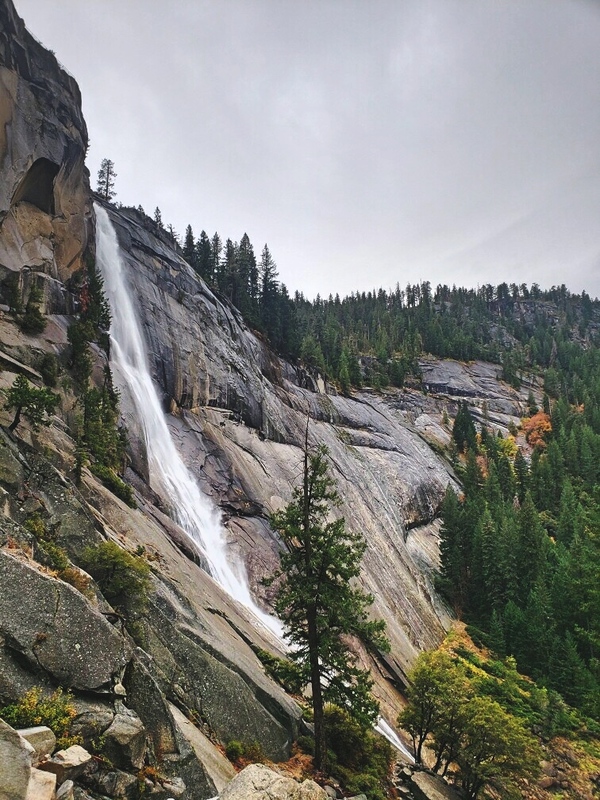 The 600-foot Nevada Falls free falls for its first 200 feet over the cliff, until it hits an outcrop of rock below that bends the water’s trajectory outward. 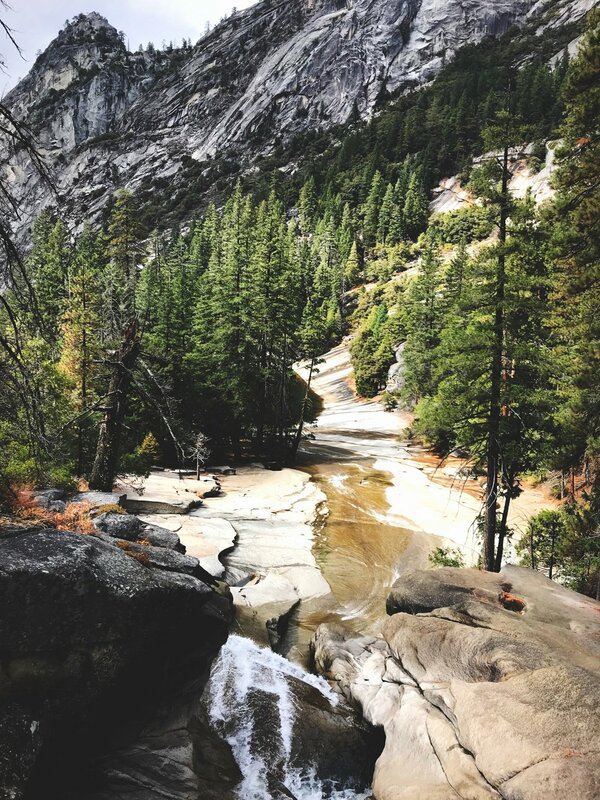 Above Nevada Falls, you can either turn around and head back on the Mist Trail, or you can take the John Muir Trail back to the Valley to get some different views of the waterfalls. 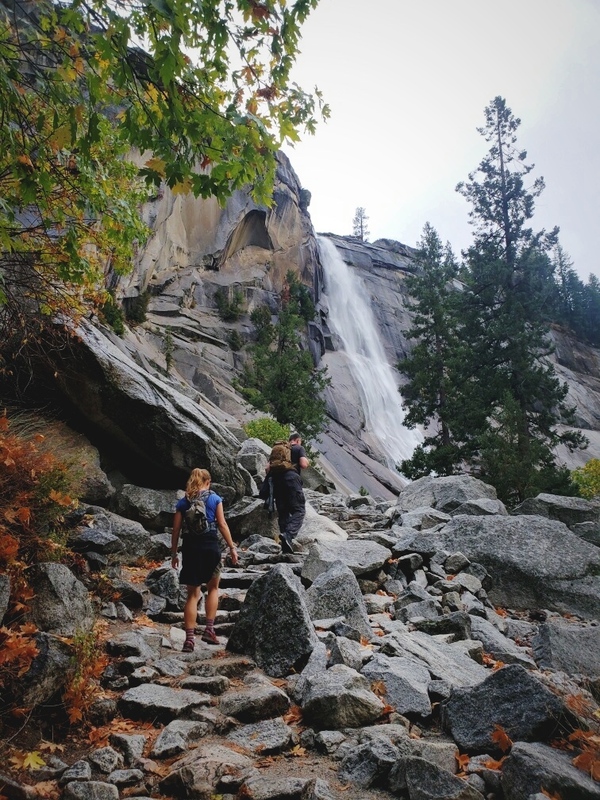 It is about a seven-mile round-trip hike to the top of Nevada Falls, depending on the route you choose. You can see how this would be a tempting natural waterslide. Climbing up the Mist Trail next to Nevada Falls. Ian and I did two trail runs on the trails in the Yosemite Valley Meadows, and we were not disappointed. The flat trails were ideal for the short, easy runs we wanted to do, and the fall weather had turned the meadows completely golden. From the meadows you can see the Half Dome and Liberty Cap to the north. The incredibly clear Merced River snakes through the valley, and if its warm there are even sandy beaches where you can swim. El Capitan is the real star of the meadow though, rising high above the valley floor. Climbers look like colorful ants scaling the wall. After our run we got out our binoculars to take a closer look at the climbers. The Yosemite Valley floor is a great place to find flat trails in Yosemite. 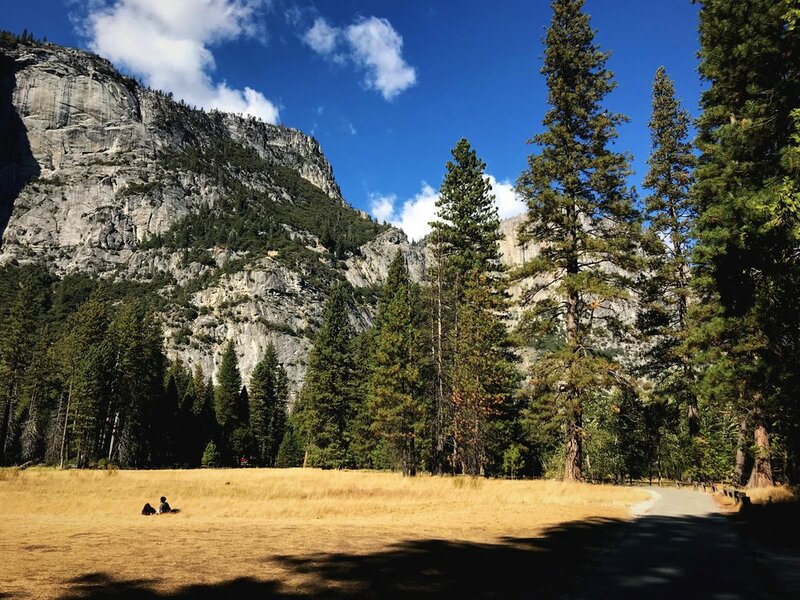 The meadows of Yosemite are the perfect place for a picnic on a sunny fall day. For many people the famous Tunnel View is the first view they get of Yosemite Valley, but when we were entering the park, the mountains were totally socked in by clouds. When we were leaving the park though, it was a perfectly clear day and we stopped to snap some photos. 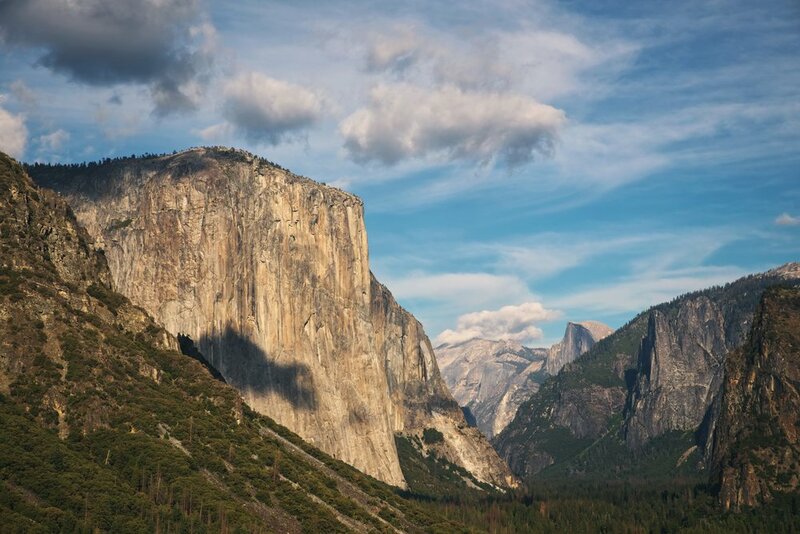 From the Tunnel View Overlook, you get a really amazing view of El Capitan and Half Dome peaks out from behind more mountains further down Yosemite Valley. Mono Lake is not actually in Yosemite National Park, but it’s so worth driving just 20 minutes beyond the northern Tioga Pass Entrance Station to see this. Unlike the valley, the northern part of Yosemite is much less developed. The mountains grow higher, drier, and wilder. As you descend from Tioga Pass you begin to leave the trees behind and you enter the sagebrush of a high desert ecosystem. Mono Lake is a huge, but shallow saline lake that is 2.5 times as salty as the ocean. The lake features white limestone “tufa towers.” These lumpy, pitted spires form from the interactions of fresh water springs and the highly alkaline lake waters. Besides the odd tufa formations, the lake supports diverse wildlife, including its own species of brine shrimp (they look like sea monkeys…), which you can see up close in displays at the visitor center. 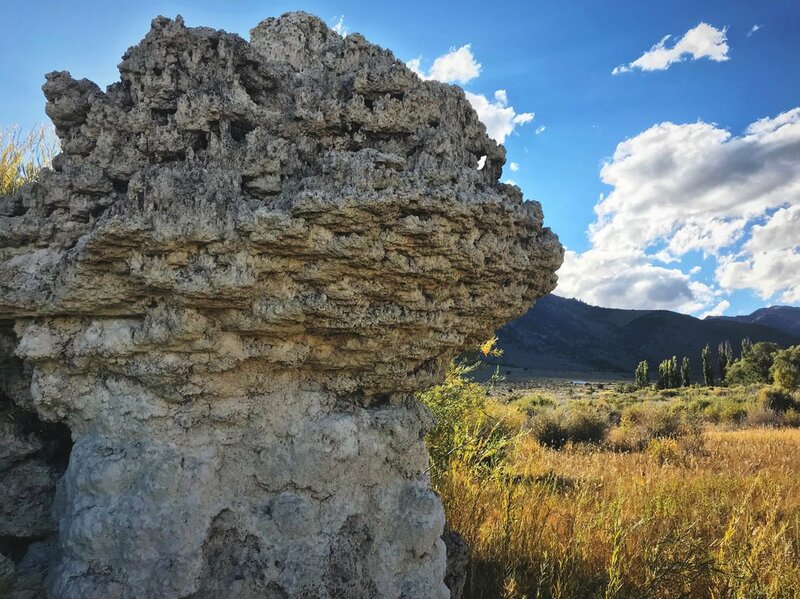 These tufa limestone formations can be found all around the shore of Mono Lake. 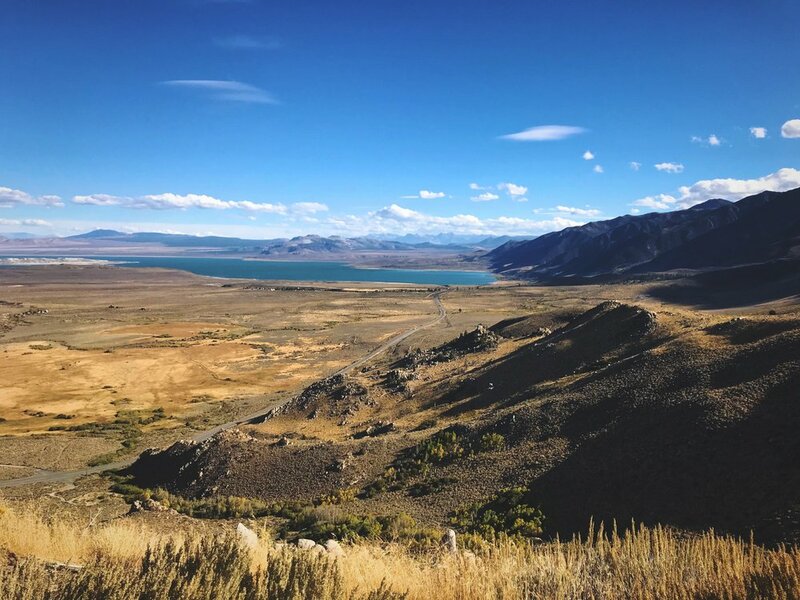 An overlook of the shallow, saline, Mono Lake. We spent a night just north of the park’s boundary parked at a small pull-off along Tioga Pass Road on Ellery Lake. The site is within the Inyo National Forest, so we assumed dispersed camping rules applied. 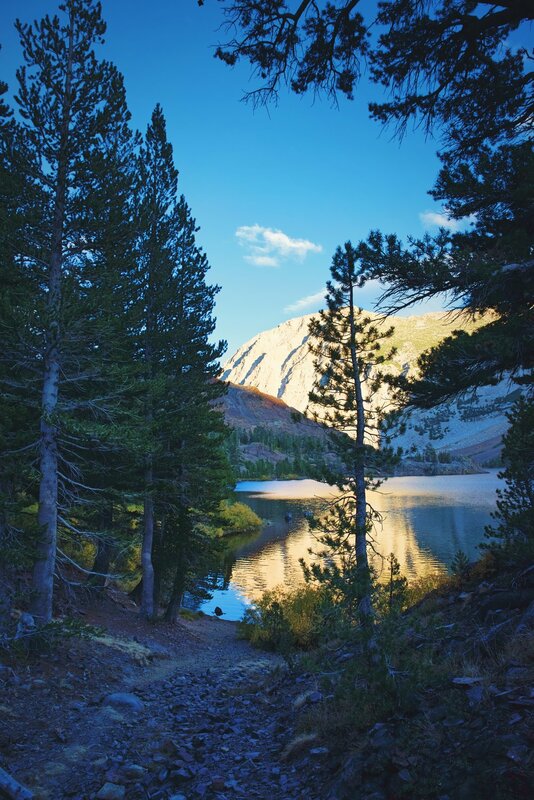 In researching for this blog post, we learned dispersed camping is prohibited along Tioga Pass Road. While nobody bothered us, we obviously wouldn’t recommend this particular spot. However, dispersed camping is allowed off the unpaved Log Cabin Mine Road and Utility Road, just a few miles further from the park boundary. The north side of the park has a really different look than the Valley. This was the coldest night we’ve experienced in the van, and the cold dry air gave us a great view of the stars. South of the park, free camping is a piece of cake! There is a large paved parking lot for a Snow Area where very large RVs could park easily—skip this if you are traveling light. Instead turn left just prior to the parking lot onto a forest road. There is a lovely clearing above the parking lot that we camped at for three nights. This would be a fine spot for tenting. There are tons of narrow forest roads that we did some trail running on and that I somehow managed to skin both my knees on. If you took these roads far enough they even lead back into park near Mariposa Grove. Another picture of the camping spot by the beautiful lake by the Tioga Pass Entrance. The Goat Meadow Sno Play Area camping spot is in the middle of a lush forest. Keep an eye out for the GIANT Sequoia cones. Bonus Tip: If you are traveling long term like us, finding a laundromat that is affordable and clean is always a challenge. In Yosemite Valley in the Housekeeping Camp there is a decent laundromat that only costs $1.25 a load!